Yes, folks - today's the day that everyone gets to learn the truth about the would-be Legionnaire with the poorly-thought-out name! Plus: a bonus secret! 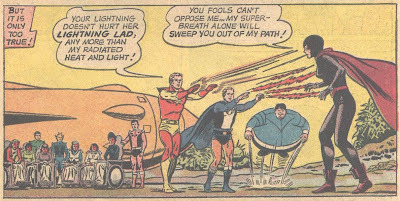 Turns out that I'm not very good at condensing Silver Age comics, so you're going to have to strain your eyes on a super-long John-post, once more. *Phew* I tell you, it's good to get that off of my chest. 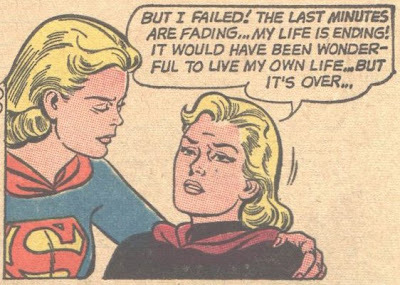 Okay, let's check in on Supergirl and the LSH. 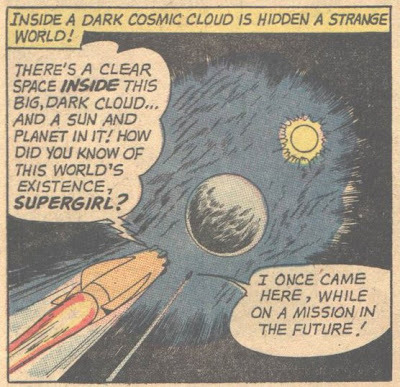 What's going on, Supergirl? You know, this is a side of the male Legionnaires that one doesn't usually see. They're not usually so... open to receiving advice. Bravo, fellas. I guess that that's a pretty good plan, especially in the DC Universe, where everybody has a weakness to something (like regular John, DCU John's weakness is beer and chicken wings. I tell you this for the same reason that Superman gave Batman that kryptonite ring: so that you can stop me if I ever go on some sort of rampage. Or am a wee bit peckish). I just hope, however, that Supergirl never has to go head-to-head with the Joker, say. Things could get ugly. 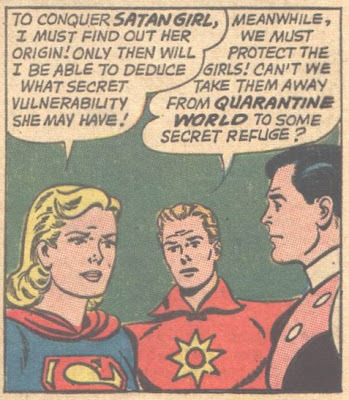 I know that pointing out logical flaws in any Silver Age comic is kind of like announcing to a beachful of people that the ocean is a bit damp, but I feel compelled - compelled, I say - to bring up the fact that Supergirl is disregarding the fact that Daxamites like Mon-El have access to serums and such that negate their weakness to lead. So Satan Girl could totally be a Daxamite. *Phew* wow, man. That... that's a big load off of my nerd-shoulders. I feel a lot better. The, uh, future that you're in right now, or the future of the future? 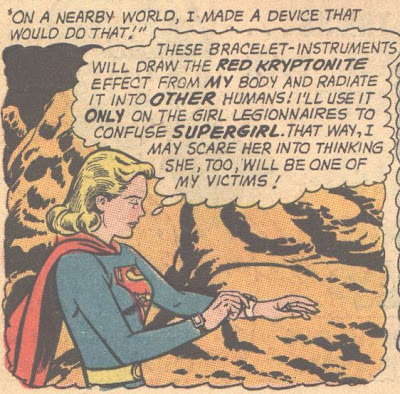 Which is it, Supergirl? NOT APPROVED, ball-things! NOT APPROVED! Okay, the ballbonations playing with Bouncing Boy is a little bit adorable. You know, I'm always kind of impressed with Supergirl and Superman when they do something like this. Not because they can deus ex machina a solution to any problem out of dirt and spit, but because they manage to make such nice-looking stuff with their bare hands. Seriously, I've sculpted enough to know that if I had the ability to fuse sand into glass with my mighty John-strength I would consistently end up with big fingerprints and those spikes that you get when you squeeze too hard and stuff oozes up between your fingers. I would not produce any perfectly-faceted diamonds or factory-perfect android-paralyzing guns. 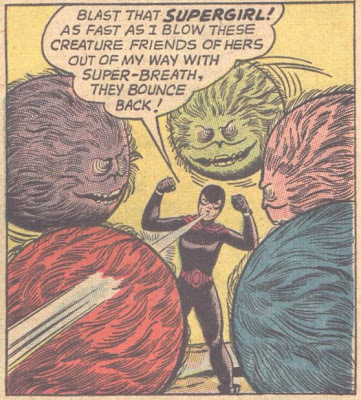 Why the hell is Bouncing Boy attacking this lady while Colossal Boy takes shelter behind some invalids? Is this how he lost the cowboy gloves, by not acting cowboy enough? Dammit! 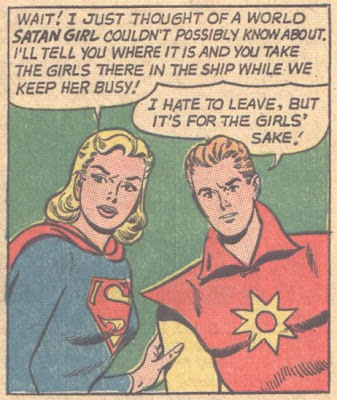 By the way, Supergirl's awesome deductions re: Satan Girl's origin? Totally wrong. Also, we're about due for "laughing with your fists on your hips" to make a comeback. Next time someone fails to thwart your schemes, give it a try! Brought to you by the Society for the Promotion of More Interesting Nostalgic Trends Than are Usually Extant. 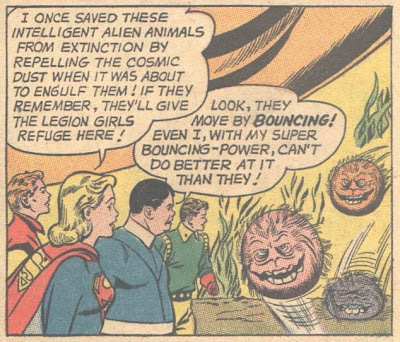 So: the Legion flees the planet, leaving the hideous ball-beings to the tender mercies of someone named Satan Girl. Did... did she just blow straight through that creature? What the hell? What power is it that she has that doesn't work on animals? Not "brain-removal breath", that's for sure. Eventually, the ball-critters lose enough of their number to make for the hills, and Satan Girl makes a startling revelation! Could this be a clue to her totally secret identity? Just where the hell did the Legion go, anyway! Now, I don't have children, and I don't get many chances to hang out with children, but I just got back from Thanksgiving dinner, and my niece and nephew were there, all full of beans. I would bet you one hundred Canadian dollars that if I gave them some puppets and told them to go play in a hole I figure I'd get my comeuppance pretty darned quickly. These giant blue extradimensional kids are weird, says I. You know what? I take back the nice things I said about the boy Legionnaires earlier. They're all high or something in this issue, seriously. 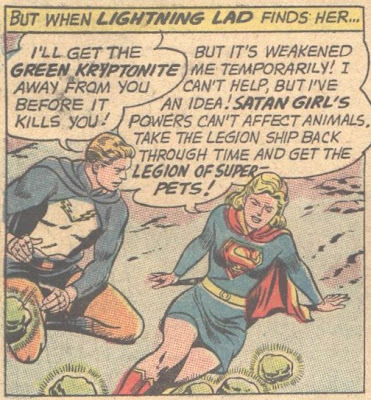 How the hell could Lightning Lad not be firing huge bolts of electricity at that lady as she flies in with a ridiculous amount of kryptonite? He and Cosmic Boy found Shrinking Violet's secret stash while they were packing her a bag to take to Quarantine World, that's how. 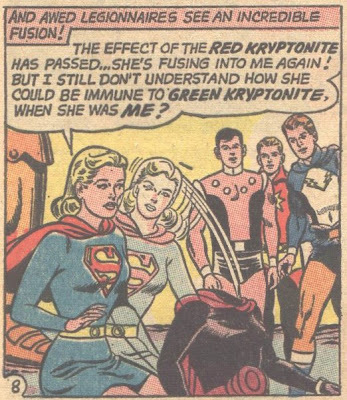 Also, does the amount of kryptonite present make any difference? 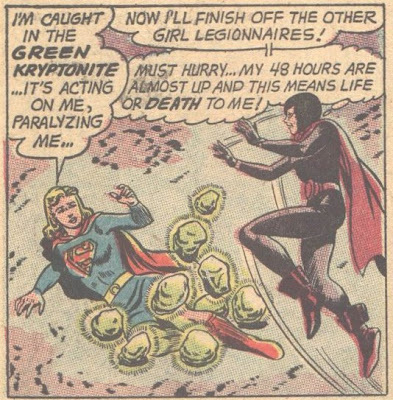 Does this giant pile of the stuff just provide more coverage, or is Supergirl basically dead? Because she seems pretty calm about this event. WHAT POWERS? The red beam thing? 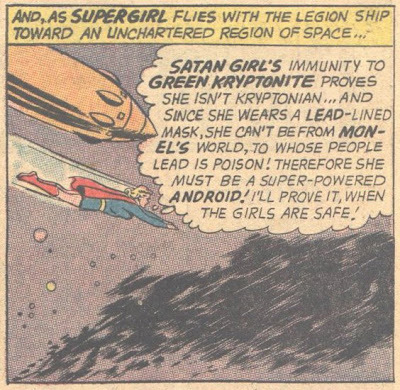 Because that doesn't seem to be working on anyone but superpowered women, Supergirl. Or do you mean the super-strength and like that, which very much did work on the ball-things - specify! And be wrong! 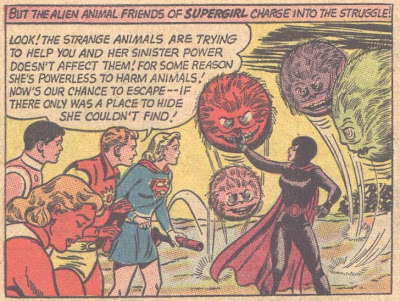 Not that calling in the Legion of Super-Pets isn't a good idea, mind you. Having half a dozen tiny versions of Superman can only help in most situations, I reckon. 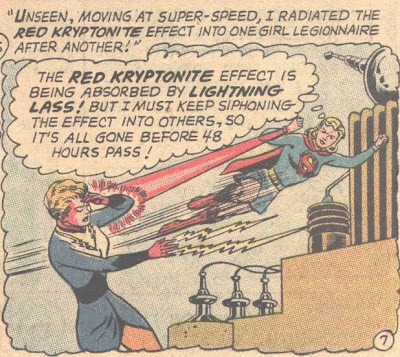 They should really be in on more super-cases - it would really speed up the average Superman/Brainiac fight, for instance. 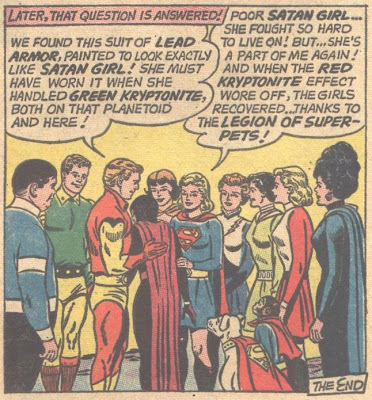 Man, Krypto and Streaky have no idea what he's talking about. Damn. I grew up around horses, and they were always trying to bite me or casually crushing me up against a wall or whatever, because horses are jerks. 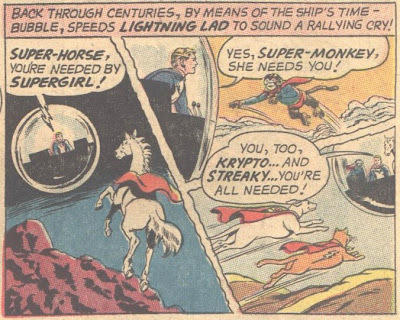 And so, I feel qualified to say that the prospect of a super-powered horse flying at me like Comet is doing in the above panel is frigging terrifying. Those things are huge. 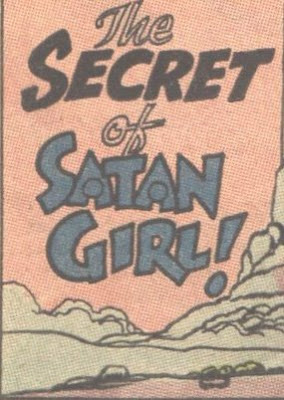 Satan Girl is a better person than me if she didn't just pee a little. Also, it turns out that it was the red rays that everyone was talking about in the context of how they don't work on animals. Okay, say I, but based on all of the evidence given in this comic they don't work on male humanoids either. 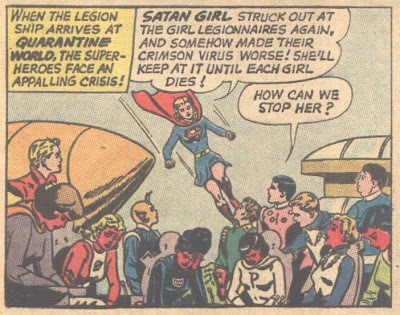 So why aren't the Legion dudes piling on top of this evil lady? Show your work, Supergirl. Dramatic secret! Awe-inspiring revelation! 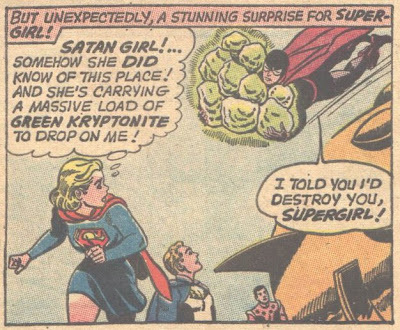 Satan Girl is a red kryptonite boojum, like 1/3 or so of the Superman Family's Silver Age adversaries. Wooooooooo! Blah, blah, red kryptonite. The more interesting aspect of this kind of story is the fact that it kind of underlines how DC super-heroes don't give two, uh poos about how the clone feels in this sort of situation. They get split into two and the new version of themself says "I want to live, Green Arrow!" and Green Arrow's all like, "Rarr, no! You are a Chartruse Arrowine double of me and you will hang around in the Arrow Cave until you cease to exist!" and then the double is a bad guy because he sees that as unreasonable. Granted, Satan Girl carries things to extremes with her "mass murder" twist on the theme, but I still think I could write a decent essay on the subject if I weren't so lazy. Okay, so that's why the dudes weren't affected. 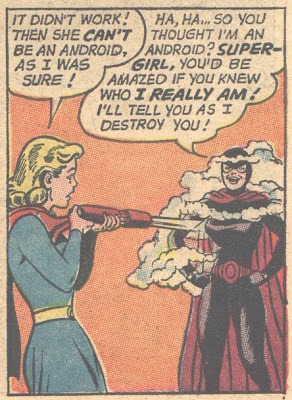 Still, Supergirl didn't know that. Blah, blah, stupid plan (sorry, I went away to work and vote and then to drink a large gin and tonic. My wit is somewhat blunted). "I take comfort in the fact that my costume was way cooler than yours *cough cough* even though I made it in, like, an hour..."
"Oh, well, she's dead. Now what's for lunch?" In closing, I'd like to say that the suit of lead armour is ridiculous. Yes folks, I just can't give the Silver Age a break. Don't worry, though: we're still on speaking terms.